2. Studio portrait of Mordechai, Feigele and their daughter (last name unknown). 3. Close up portrait of Mania and Mina Cawadel taken in the Bedzin ghetto. 5. A group of Jewish youths pose next to a fence. 7. 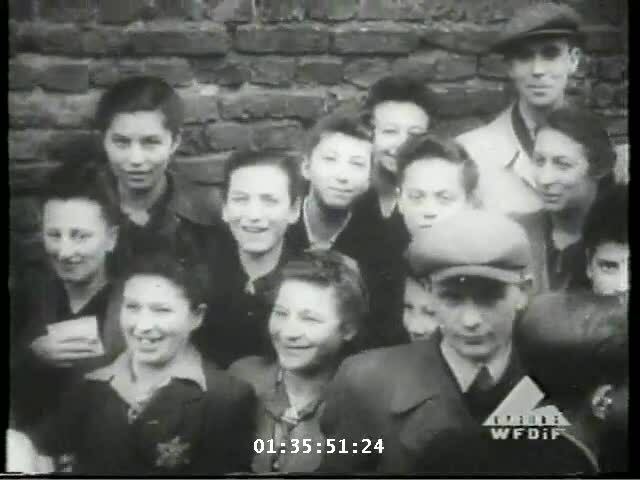 A group of friends gather outside a house in the Bedzin ghetto. 8. Marriage portrait of Szmulek and Charlotte Lustiger in the Bedzin ghetto. 9. Szmulek Lustiger poses with his wife and her family in the Bedzin ghetto. 11. Work permit issued on April 1, 1941 to Chana (Hanka) Granek authorizing her employment at the Leopold Michatz garment factory in the Bedzin ghetto.